With iOS 11 due to be released later this month, here’s a look at how Apple's iPhone operating system has changed and grown since 2007. Ten years ago, the tech world shifted dramatically with the arrival of the first pocket computer, better known as Apple’s original iPhone. The combination of touchscreen hardware and a sophisticated, dynamically adjustable interface sparked a mobile revolution that re-ordered the landscape of many industries – and forever changed how people use technology. Everything from mobile app stores to the Bring Your Own Device revolution at work to the creation of Android and a new tablet industry followed from that iPhone and the operating system it ran. With that in mind, and with iOS 11 due out within weeks, here’s a look at iOS highlights and how Apple's mobile OS has changed and evolved each year since 2007. The first iPhone relied on the slow EDGE network from AT&T for cellular internet access, had limited storage – it maxed out at 8GB – and lacked basic features such as MMS and cut/copy/paste…. And yet, it was the most remarkable piece of technology most people had ever held in the palm of their hand. The iPhone represented a paradigm shift not only for devices, but for the entire mobile industry. It was enough to knock down then top-dogs Nokia and RIM (BlackBerry) while breathing new life into competitors who until then had stuck to aping RIM’s designs. 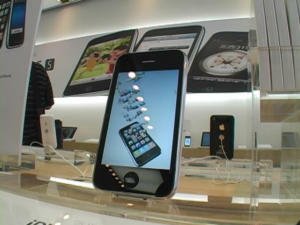 Sure, it looks dated now, but the original iPhone in 2007 had all of the main components that its successors have today. In a world full of buttons and keyboards, the iPhone was sleek and polished and it relied on a new software interface that used multitouch. In an instant, physical keyboards were out; swiping was in. The then-new dynamic UI changed based on context and function; it was sophisticated enough for long-time computer and smartphone users but simple enough to draw in tech newbies. The iPhone was a game-changer. If the opening combo of iOS and iPhone re-ordered the mobile landscape, the second version – first unveiled as a developer beta in March 2008 – solidified the iPhone’s success. With iPhone OS 2’s release on July 11, 2008, the iPhone gained an App Store, allowing third-party applications onto the iPhone platform. iPhone users could also view Microsoft Office documents in email attachments, and the iPhone software sported new enterprise-friendly features like push-email, -contacts and -calendars, as well as enforced security policies with device configuration and remote wipe. This version bolstered business support and allowed the iPhone 3G to be used in work environments with access to 3G networks for faster data access via cellular networks, support for Microsoft Exchange, Cisco IPsec VPN, WPA2/802.1x, parental controls, and additional languages – allowing the iPhone to appeal to a broader audience. First-year iPhone users got the OS update for free, while iPod Touch owners had to fork over $9.95. iPhone OS 3 and the new iPhone 3GS supported GPS and had a built-in compass, with a Maps app that could navigate users to destinations using turn-by-turn directions (effectively crippling the third-party GPS market). The iPhone also, finally, included Cut/Copy/Paste support; and the Camera app not only captured better photos but could also record video (and introduced tap-to-focus) – effectively killing the low to mid-range digital camera market. Along with push notifications, the OS 3 update also finally delivered MMS – letting users send pictures with text messages. The Apple iPhone 3GS on show at Apple's store in Ginza, Tokyo. The iPhone software came equipped with additional hardware compatibility via bluetooth and the Dock connector, allowing for brand new hardware combinations such as blood pressure monitors, heart rate monitors and other health-related accessories. Safari gained support for HTML5, paving the way for the modern internet. Voice control made its appearance, too; this precursor to Siri allowed voice dialing and basic iPod control. iPhone OS 3 also supported tethering to share network connections with other devices over USB and Bluetooth (for carriers supporting this feature). 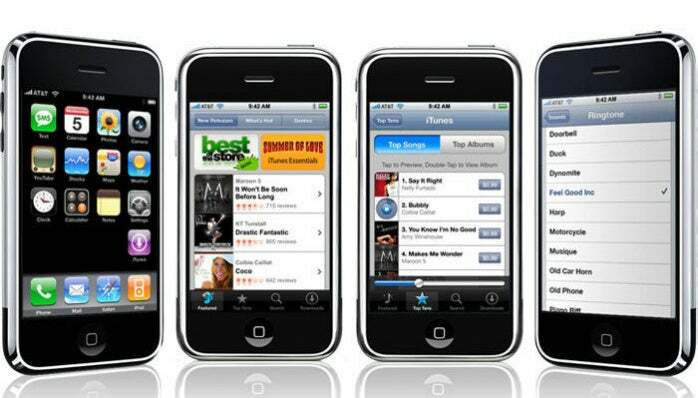 New Accessibility options were also available, but only on the iPhone 3GS, not earlier models. On June 21, 2010, Apple released iOS 4. it introduced a multitasking interface that made it easy to quickly switch between apps with a double-click of the Home button. iOS 4 – Apple had changed the name of the OS – also offered enhanced support for background processes, which allowed more functionality for apps; FaceTime video calling, for Jetsons-like video chats; folders on the Home Screen that allowed you to group together apps; support for multiple Exchange accounts – a boon for the workplace; Spotlight searching for Wikipedia and Bing (which joined Google and Yahoo! ); and it introduced the newly revised text messaging app, Messages. 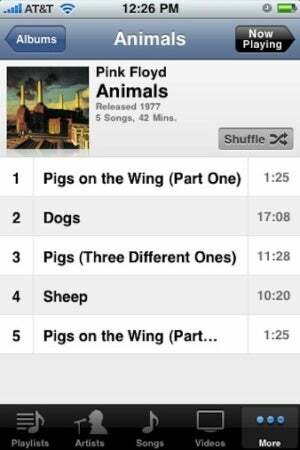 The iOS 4 version for iPods included updates to the iPod app to show more song information. Mail became more powerful, too, with the inclusion of Unified Inboxes, organized Mail threads, Quick-Look attachment support and the ability to easily create Calendar events from emails. For IT departments, the iPhone finally supported basic mobile device management, SSL VPN for Juniper and Cisco, Exchange 2010 and better data protection. This version – iOS 4.2.1 – unified the different iOS releases. (Until now, iOS iterations had been developed separately for the iPhone/iPod Touch and the iPad.) Most importantly, it delivered AirPlay, which let iOS devices stream media like video, music and photos to an AppleTV; and AirPrint, which supported printing on specific third-party printers; and major improvements to Safari and Accessibility features. 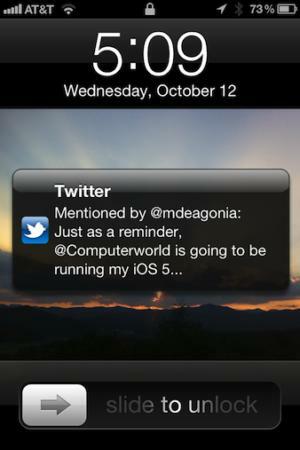 The biggest update in 2011’s iOS 5 was the revamped Notifications UI. Until iOS 5, Notifications were great for letting background apps alert you to new information, but they sat center screen, taking up space until dismissed. These new alerts slid down from the top of the screen and were stored in a Notification Center, until you wanted to read them. The revamped Lock Screen offered quick access to the new alerts system as well as the Camera and Notification Center. More important was the introduction of Siri, which helped spark the voice assistant wars that are still going on. Notifications can be set to show up on the Lock Screen or accessed after unlocking by swiping down from the top of the screen. This was also the first release to cut the cord, as it were, from iTunes; you could finally activate an iPhone without plugging it into a computer. The new Messages app bypassed SMS (and related carrier profits) by using the new iCloud, and provided end-to-end encryption for messages going to other Apple devices. AirPlay Mirroring also arrived, so you could display what was on your screen for presentations via any TV or display connected to an Apple TV. iOS 5 also marked the beginning of the development cycle we’re now familiar with, in which major iOS features are shown at Apple's Worldwide Developers Conference in June, followed by a release for developers with the final polished OS arriving in the autumn. The release of iOS 6 on Sept. 19, 2012 was significant because it marked the first time iOS users could upgrade devices over-the-air. Not coincidentally, this was also the first time most people saw upgrade problems due to a lack of storage space on the device. Those that could update (or realized they could still update by plugging into an iTunes-equipped computer) found that that Siri had been overhauled to offer info such as player stats, team rosters and standings, and game schedules for many major sports; actor information, movie trailers, and show times at local cinemas; and Yelp reviews of restaurants, as well as access to OpenTable for reservations. Siri could also be used to launch apps, perform searches on the device and update your status for Twitter and Facebook. 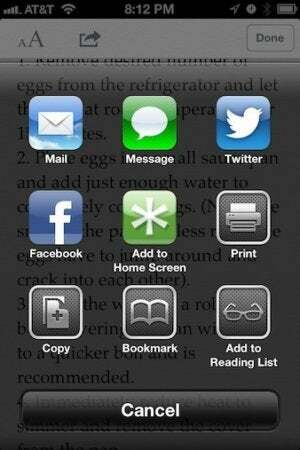 The ability to share links, images and other data got a boost with redesigned Share Sheets in iOS 6. Facebook integration was a highlight, since iOS 6 included a system-wide Share button for content; syncing between Facebook and locally stored contacts; calendar syncing for Facebook Events and Birthdays; and a Like button on the App- and iTunes Stores. The mobile social media revolution was well under way. iOS 6 also featured what would eventually become CarPlay, while Photos gained Shared Photo Streams that let you update a photo album on your iPhone and automatically alert your friends about it. Privacy controls become more granular, specifically requiring apps to get permission to access Photos, Calendars, Contacts, and Reminders; more importantly, this was the first release to feature a new Maps app backed by data acquired by Apple (shifting iOS away from Google and ending support for Google’s Street View). The new Maps app, which had something of a rocky rollout, included Siri turn-by-turn navigation, Flyover for specific cities (with 3D satellite views), Yelp integration, and crowdsourced traffic info based on anonymized data from other iPhones. Other news features included: the Camera app’s new panorama mode; iCloud Tabs in Safari (a precursor to Handoff), allowing you to continue browsing as you moved from iPhone to Mac; Passbook, Apple’s first effort at a digital wallet and one that would not gain Apple Pay support for several years; and iCloud syncing, which made it possible to create and edit a Pages doc on the iPhone and then switch to the Mac to continue work. This marked the beginning of what would eventually become Continuity and Hand Off.